Believe it or not digital marketers, Pinterest is a search engine. In fact, it’s an important search engine to understand if you sell physical products. Follow three steps to optimize search for your Pinterest channel. Pinterest is all about the pictures. You want big, beautiful, crisp pictures to grab people’s attention. Next, include a text overlay on your image. The text overlay serves as the pin’s headline, providing context and further describing the pin. The size and shape of your images matter on Pinterest. The platform is vertically oriented, so make sure that the images you use are vertical with an aspect ratio of 2:3 to 1:3.5 and a minimum width of 600 pixels. You can use horizontal images for your pins, of course, but vertical images tend to do better. Pins with an aspect ratio greater than 1:3.5 are truncated. You can use Canva to craft engaging pins with professional images and eye-catching fonts. Pinterest pins are categorized and housed in boards. You can find your boards on your profile page. Like the images you use for your pins, your board covers should be optimized with engaging, professional pictures that have text overlays to further describe the board. 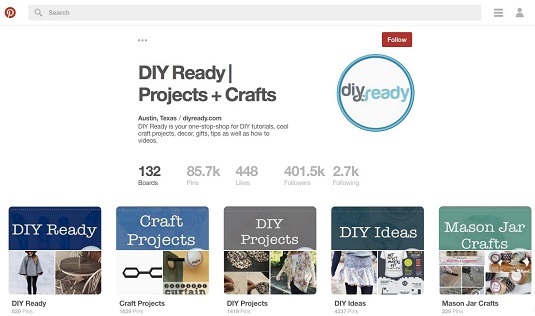 This image shows a Pinterest profile page with keyword-optimized boards that have text overlays. A keyword-optimized board from DIY Ready’s Pinterest profile page. Creativity is important in Pinterest, but avoid being cute, creative, or punny. The Pinterest search engine is less sophisticated than search engines such as Google, so your search results will improve if you use your target keywords verbatim when naming pins and boards and when adding descriptions. Type a keyword or keyword phrase in the Pinterest search engine. Make note of the suggested keywords Pinterest provides below the keyword.When you search in Pinterest, it gives prompts for keyword and keyword phrases related to what you’re searching for. This can be used to provide inspiration for keywords and phrases to optimize for in Pinterest. Create new pins and boards for any relevant keywords suggested by Pinterest, and include these keywords in the descriptions of those pins and boards. 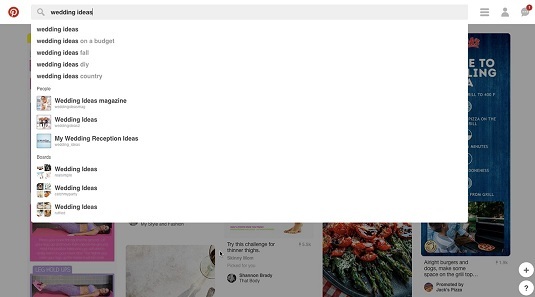 An example of prompts Pinterest gives when searching the platform.